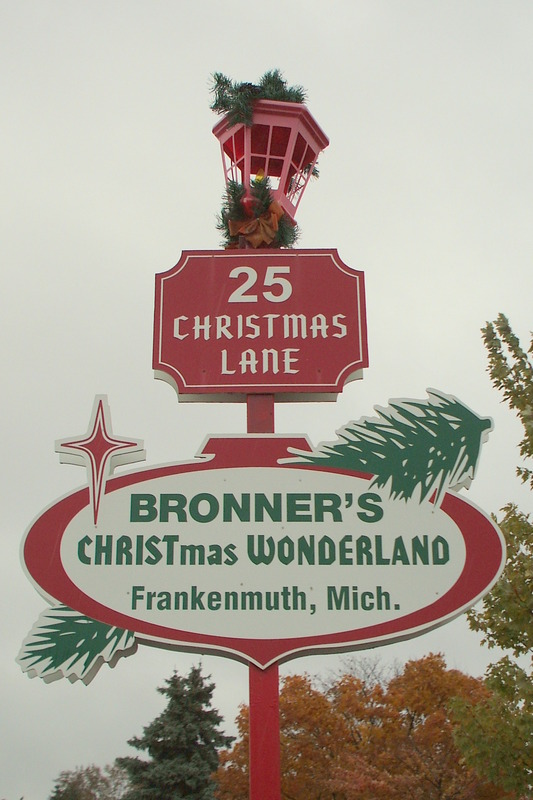 As detailed in last month’s Travel post about Bronner’s Christmas Store, we took a fun weekend trip to Michigan in October 2008. It was our first visit to Michigan and we decided to drive through Detroit because my husband and son wanted to see the Ford Assembly Plant in Dearborn. 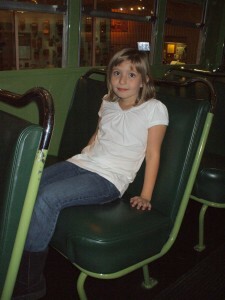 When we arrived, we found out that we needed to purchase our tickets at the Henry Ford Museum. 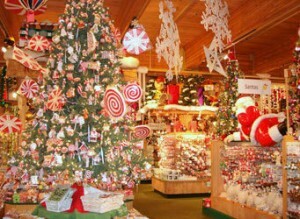 We love to go to museums when we are on a road trips and after the factory tour we planned to spend some time there. Below is a brief description of our visits to both the Ford Rouge Factory Tour and the Henry Ford Museum. After purchasing our tickets for the tour we waited a short time for the bus to take us to the Assembly Plant. 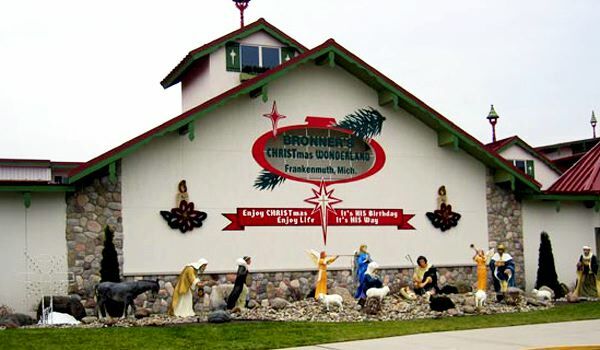 No private vehicles are allowed to drive directly there and tours are only accessible from scheduled buses which depart from the Henry Ford Museum parking lot. The Ford Rouge Factory Tour is a self-guided tour that covers five different areas at the Assembly Plant. To start the tour, we viewed two different films. The first theatre is the Legacy Theatre which shows a 13 minute film that includes rarely shown footage from the Ford archives and is a great way to learn about Henry Ford and the history of the Ford Motor Company. Next was another film in the Art of Manufacturing Theatre which has seats that swivel 360 degrees to view a presentation on seven huge screens positioned around the theatre. The 14 minute film shown is an amazing multisensory experience that gives a virtual tour of the assembly process. SPECIAL NOTE: The sights and sounds of this film can be rather intense and loud, so please be advised if you have small children that could get easily scared! After viewing both films, we were directed to take an elevator up to the Observation Deck where we got a panoramic view the Ford Rouge complex. 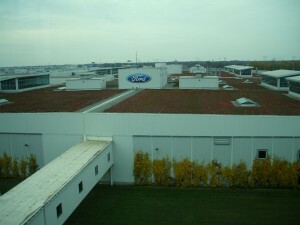 From here you can also see the “Living Roof” atop the Final Assembly building of the Dearborn Truck Plant. In 1999, the 1.1 million square foot facility was given an environmental redesign and is covered by more than 10 acres of a low growing ground cover called sedum. The sedum retains rainwater and the organic treatment system will clean and use over 20 billion gallons of the recycled rainwater annually for the facility. The sedum also moderates the internal temperatures of the building. When we were done on the Observation Deck, we took the elevator down for the Assembly Plant Walking Tour. (This is the part of the tour that my husband and son were excited to see!) The self-guided 1/3 mile walking tour took us through the Ford Motor Company’s Dearborn Truck Plant where we were able to view the final F-150 Truck assembly line from an elevated walkway. Along the tour there are interactive kiosks that explain the various stations of the assembly line and were a great way to learn more about the manufacturing process. The final area of the tour is the Legacy gallery, where several different vehicles that defined the Ford Motor Company are on display. At the time we visited the cars on display were the 1929 Model A, the 1949 Coupe, the 1955 Thunderbird, the 1965 Mustang and of course the F-150 Truck which we saw being put together on the assembly floor. 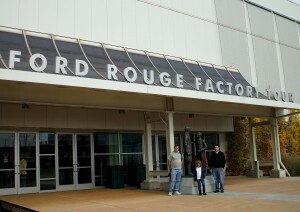 The Ford Rouge Tour was very interesting and we all enjoyed it, especially my husband and son! When we arrived to take the Ford Factory Tour, we thought that the Henry Ford Museum was going to be only about the Ford Motor Company. We were pleasantly surprised to find that not only did the museum have a large collection of cars, trains and aircraft but they also had a wonderful collection of historical items. 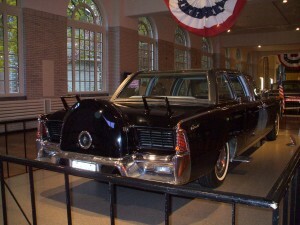 A couple of the items that really stood out for us where three Presidential items: the 1961 Lincoln Continental Presidential car that John F. Kennedy was riding in Dallas, Texas on November 22, 1963 when he was assassinated, the chair that Abraham Lincoln was sitting in at Ford’s Theatre in Washington D.C. when he was shot, and George Washington’s camp bed that he used during the Revolutionary War. 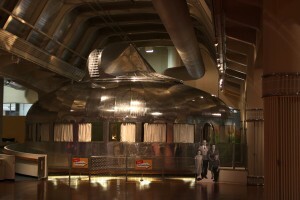 One very interesting exhibit was the Buckminster Fuller’s Dymacion house of the future prototype. The architect wanted this house to be mass-produced, easy to ship and assemble. At a cost $6500 in 1946, this aluminum house had two bedrooms built entirely in the round and was designed to be the strongest, lightest and most cost effective and space efficient home ever built. 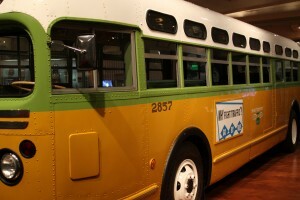 Another historical item was the Montgomery, Alabama bus that Rosa Parks was riding on December 1, 1955 when she decided not to give up her seat to a white man and move to the back of the bus. This brave African American woman challenged the segregation laws and her arrest lead to the Montgomery Bus Boycott that sparked the beginnings of the civil rights movement. As we were listening to the museum docent tell us the story about Rosa Parks, he invited our daughter to sit in the seat that Mrs. Parks refused to give up – it was a very powerful moment and a great history lesson! Construction on the Ford Rouge Complex began in 1917 along the Rouge River in Dearborn, Michigan. It was completed in 1928 and included 93 buildings in an area 1.5 miles wide and 1 mile long. This huge complex has over 100 miles of railroad tracks, an electricity plant and an ore processing facility. The Rouge boasts that it was able to turn raw materials into completed vehicles all within one complex. The original building B, part of the legendary Dearborn Assembly Plant, first started producing Ford Model A vehicles in the 1920’s and continued with cars such as the Mercury, the Thunderbird and the Mustang. After the 1960’s, the Ford Motor Company began to build many factories across the country. Eventually only the Mustangs were being produced at the Dearborn Plant and on May 10, 2004 the last Mustang rolled off the assembly line. The historic Dearborn Assembly Plant was demolished in 2008 and was replaced with the current modern Dearborn Truck Assembly Plant which is producing F-150 trucks. Originally called the Edison Institute for Henry Ford’s personal friend, Thomas Edison, the Institute was dedicated on October 21, 1929 a date which was chosen in celebration of the 50th anniversary of the first successful incandescent light bulb. Some of the 260 people in attendance that day were Thomas Edison, Henry Ford, President Herbert Hoover, Marie Curie, George Eastman, John D. Rockefeller, and Orville Wright. At the time the Institute consisted of two building which Henry Ford had moved from Edison’s Menlo Park, New Jersey and re-constructed in Dearborn, Michigan to look exactly like Edison’s laboratory was in 1879. Eventually, the Institute was renamed the Henry Ford Museum after Ford’s death in 1947. 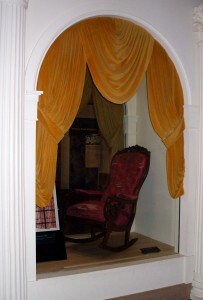 The Henry Ford Museum began as Ford’s personal collection of historical items that he began collecting as far back as 1906. Ford wanted to showcase the American people and their ideas that changed our lives. The museum is now one of the largest museums in the country.